The renovated 1896 hotel now welcomes overnight visitors. On trips to the Hamilton County town of Hico over the years, I’d wondered why the handsome 1896 Midland Hotel building had remained sorely neglected. An imposing corner building at the center of a charming vintage downtown, the two-story brick landmark had clearly been a showplace in its heyday. 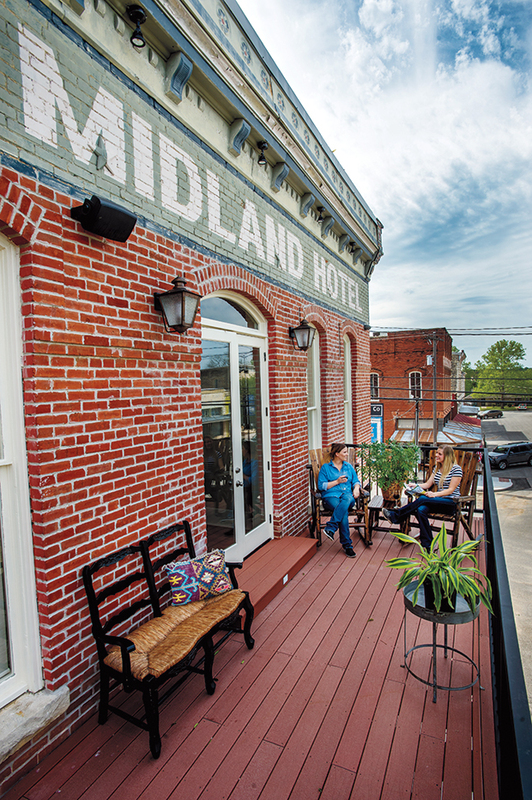 The Midland Hotel, is at 103 N. Pecan St. in Hico. Call 254/796-4426; www.historicmidlandhotel.com. Rates start at $189. Just outside the Midland Hotel, find many places to shop and dine. Happily, though, on recent getaway trips to Hico—an easy escape from my home in Fort Worth for a weekend of shopping, roadhouse dining, and stargazing—I watched with anticipation as the Midland began showing signs of renewal. Purchased by a local development group in 2014, the relic began to slowly transform. When the hotel reopened in January after two years of careful restoration and renovation, I made plans to stay overnight and delight in all the discoveries. Much of the credit goes to Roy Ward, the chief financial officer for the development company and now Midland Hotel’s general manager. After negotiating the deal, Roy threw himself into the 13,000-square-foot project, a formidable task. The hotel’s second floor had served as a rooming house but sat empty since the late 1970s; the ground floor had been rented here and there to various retailers. Though the exterior survived the years well, none of the interiors had been maintained. Bead board from ceilings and walls remained in good shape, as had the guest room doors and transoms, which were restored and are in top form now. The Wards even found the door to the newspaper office that once operated on the ground floor; it’s now the entrance to the guest business center off the lobby. Both Roy and Mary Ann sought local input every step of the way, beginning with their choice of architects for the project. Roy praises the wagonload of help provided by Stephenville architect Fred Parker, who grew up on a nearby ranch. “Fred not only drew new floor plans, he also shared extensive knowledge about the area and its history, which was so valuable to us,” Roy says, explaining that he and Mary Ann settled in Hico after years of splitting time between homes in Fort Worth and New Mexico. The Wards leaned on Parker and other area natives to help them bring the hotel’s theme to life: telling the story of the region. To do that, Mary Ann shaped each of the 14 guestrooms (13 upstairs, with an ADA-compliant room on the ground floor) into a local history lesson. As construction on the hotel’s reinvention progressed, Mary Ann pursued vintage photography, newspaper clippings, maps, books, and mementoes to create individual personalities for each room and public space. “Because we wanted to connect the hotel with the community, we named the rooms for founding families or for nature and heritage found in Hico and Hamilton County,” Mary Ann explains, noting that local lore added color and texture to her research. She points out the window of the Connally & Company Suite, which was named for a furniture store that once operated across the street. “One tale I heard was that when Clyde Barrow was rumored to be visiting family here in Hico, the law—hoping to catch him—would hide in caskets made there in the store,” Mary Ann says. Some of the design touches take whimsical form: The Wiseman Suite takes its name from a photographer whose early-1900s photos of Hamilton County hang all over the hotel. The Railroad Station suite is outfitted with a train station bench Mary Ann found at a shop in Waco. And the bed in the Texas Ranching Room sports a headboard fashioned from a ranch gate. My favorite is the Caulder Suite, named for Nelda Caulder, the last rooming-house resident to leave in the late 1970s. Here are photos of Ms. Caulder as a girl and as a young woman, along with a framed family brand. The bed boasts a brightly striped spread and an embroidered blanket and pillows with Latin American styling; the windows are fit with antique panes of beveled, stained glass. Best of all, a door leads to a wide balcony overlooking the street, complete with rocking chairs ready for timeout with a glass of wine. Mary Ann found tables, lamps, and other accent pieces at stores right outside the hotel’s front door, such as Blue Star Trading Co. and Hill Country Dwellings. Several of her local finds figure into public spaces, like in the atrium area upstairs, with comfortable seating where you can read a book or take in the hubbub in the dining room below. I find myself smiling at a large photograph of two curious dogs poking their noses through a barn door; the photo was taken by a local teenager whose effort won a ribbon at the State Fair of Texas. Another artfully decorated public space features a vivid painting of prickly pear cactus, framed by a large section of worn fencing cut into a half-moon shape. Another nine paintings of cattle, horses, and other scenes (including a high school football scoreboard) hang on the soaring limestone walls throughout the ground floor of the hotel. They’re the work of local artist Jerry McAdams, who paints at his ranch just south of town. McAdams, who also publishes Hico’s weekly newspaper, The Hico News Review, appreciates what the Midland’s opening means for Hico, noting a significant ramping up of overall activity downtown, particularly on weekends. The hotel’s restaurant, The Chop House, serves three meals daily, with a menu ranging from omelets and banana pancakes to burgers, shrimp cocktail, and steaks. In addition, locals and visitors alike can enjoy cocktails and wine at the attached 1896 Saloon. Chef-restaurateur and sommelier Phil Greer, who runs a restaurant in nearby Stephenville called Greer’s Ranch Café, developed The Chop House’s menu and is frequently found in the kitchen. At dinner with my mom, I’m especially taken with the tender, supple “baseball cut” sirloin steak, cooked exactly to my requested temperature, topped with herbed butter and served with loaded mashed potatoes. The pairing with a big, deeply purple cabernet sauvignon from Washington’s Disruption Wines is a welcome surprise. That’s just a sample of the Midland’s effect on the town and on folks stopping by. As visitors pop in for the impromptu tour that the Wards and staff are forever leading, we overhear folks say they’d like to come back for a family reunion or just the next weekend getaway. We’ll be back to Hico sooner rather than later; you’ll find us rocking on the balcony and enjoying that glass of wine.